N26 Invest is an easy, hands-off way to invest your money and achieve financial growth. It’s linked directly into your N26 account, offers only top-quality, professional-selected investment options, and requires zero management from you. More serious investors will prefer the flexibility and control of Capital.com, but for the average person looking to boost their annual returns, N26 Invest is an excellent choice. Just days after receiving its banking license back in the summer of 2016, N26 unveiled one of its hottest product launches to date: N26 Invest. N26 Invest is designed to put your money to work without the hassle and stress of managing your own portfolio. You can choose from several managed, diversified portfolios to find the one that best meets your investment goals. And you can track it all from your phone. You can open an N26 Invest account with a couple of taps–no paper applications or in-person meetings required. Managing it is just as easy. Instant Access: Add or remove money from your portfolio at a moment’s notice. Scheduled Deposits: Automatically add a pre-set amount to your investments each month to ensure your nest egg is always growing. Completely Paperless: Investment accounts can often have a lot of paperwork involved. N26 Invest is completely paperless, with all your documents sent digitally. Automatic Equity Rebalancing: Your portfolio automatically rebalances its stock/bond ratio at the start of every year, ensuring your investment goals are right on track. Transparent Fees: N26 makes it crystal clear whenever you need to pay a fee, something the big banks adamantly avoid. You either pay an annual management and service fee of 0.99% or, if your balance is below €2,300, a monthly fee of €1.90. This does not include the management fee charged by the index funds themselves, which is worked into your annual returns. These three options actually represent three distinct portfolios made up of five index funds (passively-managed funds) each. These index funds are provided by Dimensional Fund Advisors, selected and managed by vaamo, and held under your name at First Fidelity Bank. N26 Invest is an excellent tool for putting away a bit of cash here and there. It’s easy to use, offers just a few high-quality options, and is linked directly into your N26 account for your convenience. But if you’re a serious investor–someone who’s ready to take their investment portfolio into their own hands–there’s a much better tool at your disposal. Capital.com is one of the easiest and cheapest ways to trade leveraged CFDs on equities, commodities, indices, forex pairs and cryptocurrencies anywhere in the world. Unlike other CFD trading platforms, Capital.com’s proprietary Negative Balance Protection means you’re protected when your positions drop, so you can never lose more than the amount you invest in your account. No Fees: That’s right–Capital.com doesn’t charge any fees for day trading, and holding an overnight position costs in the range of 0.001% to 0.05%, an extremely low price. Most other trading platforms charge fees that are around 0.5% no matter what time of day you execute your trade. Multiply Your Returns: Since you can invest with leverage on Capital.com, your gains multiply in a serious way. For example, you can buy most forex pairs on Capital.com with 30x leverage, which means that if a currency moves 2% in value, the real return to you is actually 5x that, or 60%. Of course, losses work in the same way. 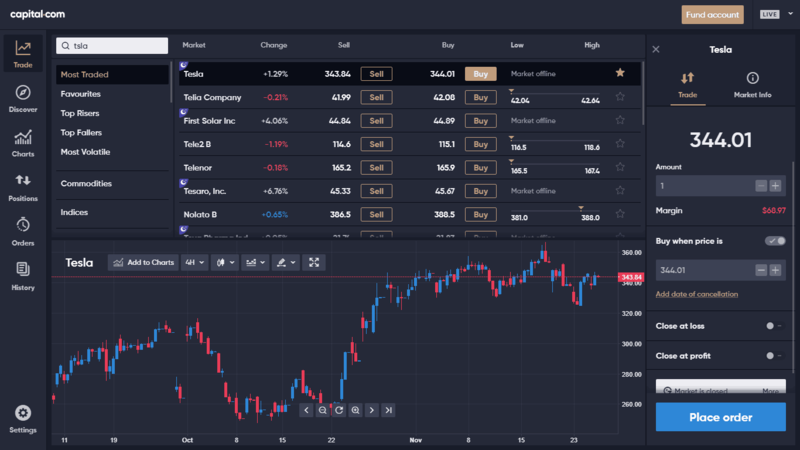 Easy To Use: If you’re a professional trader, this won’t be an issue for you, since the Capital.com trading interface feels a lot like a Bloomberg terminal. If you’re not a pro, though (neither am I), they’ve made it simple and straightforward enough that you can do everything you want with ease. My experience with Capital.com has been extremely positive, so I suggest anyone looking to seriously amplify their investment portfolio to give them a try. Sign up for N26, log into the app on your phone, and select your initial investment amount. It can be anything larger than €100. Choose your growth objectives by selecting Invest 40, Invest 60 or Invest 80. See your projected outcome for the future. This is just an estimate of how your money is expected to grow, not a guarantee. Remember: you can deposit and withdraw your money at any time. There are no long-term commitments with N26 Invest. How Risky Is N26 Invest? Not as risky as you’d think. For example, even though the Invest 80 plan is 80% stocks/equities and just 20% bonds, you’re still investing in a collection of index funds selected by the professional wealth managers at vaamo, which means that your positions are already highly diversified. In fact, each plan includes a blend of professional funds spread out over 15,000 financial assets worldwide, which means that no single stock or bond will make up a significant portion of your investment holding. So don’t worry–no single black swan event is going to ruin your hard-earned wealth. N26 Invest is an excellent tool for N26 customers looking for a bit more growth. Yet it’s not even one of the best features that come with N26 Black and N26 Metal, both of which are highlighted by their remarkable travel & medical insurance policies. Come for the insurance, stay for N26 Invest, we’d say. You’ll be happy you did.